Pirate Party is a label adopted by political parties in different countries. Pirate parties support civil rights, direct democracy and participation in government, reform of copyright and patent law, free sharing of knowledge (open content), information privacy, transparency, freedom of information, anti-corruption and Internet neutrality. 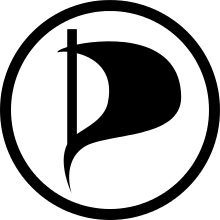 The first Pirate Party to be established was the Pirate Party of Sweden (Swedish: Piratpartiet), whose website was launched on 1 January 2006 by Rickard Falkvinge. Falkvinge was inspired to found the party after he found that Swedish politicians were generally unresponsive to Sweden's debate over changes to copyright law in 2005. The United States Pirate Party was founded on 6 June 2006 by University of Georgia graduate student Brent Allison. The party's concerns were abolishing the Digital Millennium Copyright Act, reducing the length of copyrights from 95 years after publication or 70 years after the author's death to 14 years, and the expiry of patents that do not result in significant progress after four years, as opposed to 20 years. However, Allison stepped down as leader three days after founding the party. The Pirate Party of Austria (German: Piratenpartei Österreichs) was founded in July 2006 in the run-up to the 2006 Austrian legislative election by Florian Hufsky and Jürgen "Juxi" Leitner. The 2009 European Parliament election took place between the 4 and 7 June 2009, and various Pirate Parties stood candidates. The most success was had in Sweden, where the Pirate Party of Sweden won 7.1% of the vote, and had Christian Engström elected as the first ever Pirate Party Member of European Parliament (MEP). Engström described the result as "fantastic" and said "we will use all of our strength to defend personal integrity and our civil rights". Following the introduction of the Treaty of Lisbon, the Pirate Party of Sweden were afforded another MEP in 2011, that being Amelia Andersdotter. On 30 July 2009, the Pirate Party UK was registered with the Electoral Commission. Its first Leader was Andrew Robinson, and its Treasurer was Eric Priezkalns. In April 2010, an international organisation to encourage cooperation and unity between Pirate Parties, Pirate Parties International, was founded in Belgium. In the 2011 Berlin state election to the Abgeordnetenhaus of Berlin, the Pirate Party of Berlin (a state chapter of Pirate Party Germany) won 8.9% of the vote, which corresponded to winning 15 seats. John Naughton, writing for The Guardian, argued that the Pirate Party of Berlin's success could not be replicated by the Pirate Party UK, as the UK does not use a proportional representation electoral system. In the 2013 Icelandic parliamentary election, the Icelandic Pirate Party won 5.1% of the vote, returning three Pirate Party Members of Parliament. Those were Birgitta Jónsdóttir for the Southwest Constituency, Helgi Hrafn Gunnarsson for Reykjavik Constituency North and Jón Þór Ólafsson for Reykjavik Constituency South. Jónsdóttir had previously been an MP for the Citizens' Movement (from 2009 to 2013), representing Reykjavik Constituency South. Currently, it is the largest political party in Iceland. In the most recent election, it won 23.9% of the vote. The 2014 European Parliament election took place between the 22 and 24 May. Julia Reda was at the top of the list for Pirate Party Germany, and was subsequently elected as the party received 1.45% of the vote. Other notable results include the Czech Pirate Party, who received 4.78% of the vote, meaning they were 0.22% off getting elected, the Pirate Party of Luxembourg, who received 4.23% of the vote, and the Pirate Party of Sweden, who received 2.19% of the vote, but lost both their MEPs. Reda had previously worked as an assistant in the office of former Pirate Party MEP Amelia Andersdotter. On 11 June 2014, Reda was elected Vice-President of the Greens/EFA group in the European Parliament. Reda was given the job of copyright reform rapporteur. The Icelandic Pirate Party was leading the national polls in March 2015, with 23.9%. In the entire history of Iceland as an independent country, this was the first time a political party other than the Independence Party polled as the largest party. The Independence Party polled 23.4%, only 0.5% behind the Pirate Party. According to the poll, the Pirate Party would win 16 seats in the Althing. Rick Falkvinge described the news as "bloody awesome". In April 2016, in the wake of the Panama Papers scandal, polls showed the Icelandic Pirate Party at 43% and the Independence Party at 21.6%, although the Pirate Party eventually won 15% of the vote in the 29 October 2016 parliamentary election. Do not accept or espouse discrimination of ethnicity, origin, beliefs and gender. Use free software, free hardware, DIY and open protocols whenever possible. Politically defend an open, participative and collaborative construction of any public policy. Some campaigns have included demands for the reform of copyright and patent laws. In 2010, Swedish MEP Christian Engström called for supporters of amendments to the Data Retention Directive to withdraw their signatures, citing a misleading campaign. Pirate Parties International (PPI) is the umbrella organization of the national Pirate Parties. Since 2006, the organization has existed as a loose union of the national parties. Since October 2009, Pirate Parties International has had the status of a non-governmental organization (Feitelijke vereniging) based in Belgium. The organization was officially founded at a conference from 16 to 18 April 2010 in Brussels, when the organization's statutes were adopted by the 22 national pirate parties represented at the event. The European Pirate Party (PPEU) is a European political party founded in September 2013 which consists of various pirate parties within European countries. Pirates Without Borders is an international association of pirates. Unlike Pirate Parties International (which accepts only parties as voting members and organizations as observing members), Pirates Without Borders accept individuals as members. The PWB see themselves as a basis for international projects. Through global cooperation, they strive to reveal the impact of multinational trade agreements on all people on Earth, and foster freedom and democracy. PWB originates from an independent committee for the coordination of Pirate parties in German-speaking countries, known as DACHLuke (DACHL = Germany-Austria-Switzerland-Luxembourg). Since the Pirate Parties International Conference 2011 on 12 and 13 March 2011, PWB is an "observing member" of Pirate Parties International. The previously independent project "pirate streaming" has become a part of Pirates without Borders since 3 May 2011. In Parti Pirate Francophone, the French-speaking Pirate Parties are organized. Current members are the pirates parties in Belgium, Côte d'Ivoire, France, Canada, and Switzerland. Representatives of the Pirate Party movement that have been elected to a national or supranational legislature. Outside Sweden, pirate parties have been started in over 40 countries, inspired by the Swedish initiative. ↑ Anderson, Nate (26 February 2009). "Political pirates: A history of Sweden's Piratpartiet". Ars Technica. Retrieved 7 August 2015. ↑ Downie, James (24 January 2011). "What is the Pirate Party—and why is it helping Wikileaks?". New Republic. Retrieved 7 August 2015. ↑ Igler, Nadja (19 September 2006). "Österreichs Piraten sehen grün". Future Zone (in German). Retrieved 7 August 2015. ↑ "European elections 2009: Sweden's Pirate Party wins a seat in parliament". The Telegraph. 8 June 2009. Retrieved 7 August 2015. ↑ Edwards, Chris (11 June 2009). "Sweden's Pirate party sails to success in European elections". The Guardian. Retrieved 7 August 2015. ↑ Harris, Mark (11 August 2009). "Pirate Party UK sets sail". techradar. Retrieved 8 August 2015. ↑ "Pirate Party launches UK poll bid". BBC News. 13 August 2009. Retrieved 8 August 2015. ↑ Barnett, Emma (11 August 2009). "Pirate Party UK now registered by the Electoral Commission". The Telegraph. Retrieved 8 August 2015. ↑ "Pirate Parties: From digital rights to political power". BBC News. 18 October 2011. Retrieved 8 August 2015. ↑ Dowling, Siobhan (18 September 2011). "Pirate party snatches seats in Berlin state election". The Guardian. Retrieved 7 August 2015. ↑ Kulish, Nicholas (19 September 2011). "Pirates' Strong Showing in Berlin Elections Surprises Even Them". New York Times. Retrieved 7 August 2015. ↑ Naughton, John (20 September 2011). "Could the Pirate party's German success be repeated in Britain?". The Guardian. Retrieved 7 August 2015. ↑ "Iceland vote: Centre-right opposition wins election". BBC News. 28 April 2013. Retrieved 8 August 2015. ↑ Penny, Laurie (8 May 2013). "Laurie Penny on Iceland's elections: A shattered fairy tale". New Statesman. Retrieved 8 August 2015. ↑ Edick, Cole (2015). "The Golden Age of Piracy". Harvard International Review. 36 (4): 7–9 – via Ebscohost. ↑ Collentine, Josef Ohlsson (26 May 2014). "All Pirate Party votes in the EU election". Pirate Times. Retrieved 8 August 2015. ↑ Nordenfur, Anton (6 January 2014). "Julia Reda tops German list to European Parliament". Pirate Times. Retrieved 8 August 2015. ↑ Reda, Julia. "Election as Vice-President of the Greens/EFA Group". Julia Reda. Retrieved 8 August 2015. ↑ Steadman, Ian (29 January 2015). "The Pirate Party's lone MEP might just fix copyright across the EU". New Statesman. Retrieved 8 August 2015. ↑ Hudson, Alex (19 March 2015). "The Pirates becomes the most popular political party in Iceland". Mirror. Retrieved 7 August 2015. ↑ "The Pirate Party is now measured as the biggest political party in Iceland". Vísir. 19 March 2015. Retrieved 7 August 2015. ↑ Björnsson, Anna Margrét (6 April 2016). "Almost half of Icelandic nation now want the Pirate Party". Iceland Monitor. Retrieved 6 April 2016. ↑ Copley, Caroline (20 September 2009). "Germany's 'Pirate Party' hopes for election surprise". Reuters blog. Reuters. Retrieved 5 March 2014. ↑ Engström, Christian (2 June 2010). "Urging MEPs to withdraw their Written Declaration 29 signatures". Christian Engström blog. WordPress.com. Retrieved 5 March 2014. ↑ "22 Pirate Parties from all over the world officially founded the Pirate Parties International". Pirate Parties International. 2010-04-21. Retrieved 2012-04-05. ↑ "Here comes the European Pirate Party". PirateTimes. ↑ "Pirates without Borders Wiki". Pirates without Borders. Retrieved 2012-04-05. ↑ "Piratenpartij presenteert verkiezingsprogramma" (in Dutch). 3VOOR12 NL. 2010-05-20. Retrieved 2011-04-09. Pirate Party International, official website.